Preparing a party at home can be time consuming, stressful and expensive, so let The Elks Place take away the stress of entertaining kids in your own home by providing the birthday party venue of a lifetime at the home of Elko and Elka. Birthdays are wonderful milestones and days to celebrate and make memories. That is why at The Elks Place, we make sure each birthday party celebrated with us is filled with the utmost fun and joy. We will do all the work for you so that you can enjoy the occasion with family and friends. 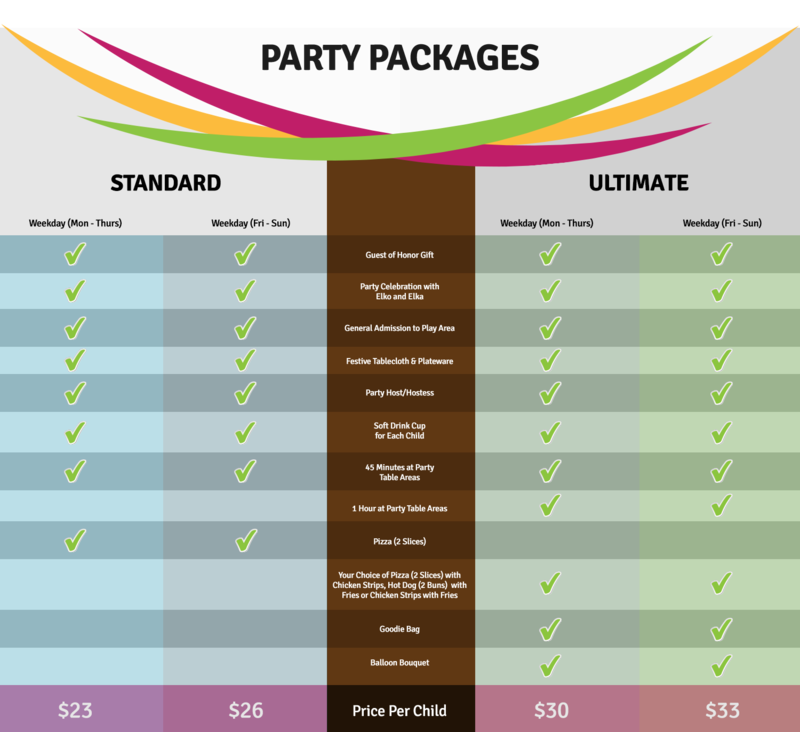 We have birthday party packages to fit your needs; select one and leave the rest to us! Interested in booking a party with us? *Kindly note that you will be charged based on the number of children who show up at the party. *Please note that the selected party time is the time you are reserving the party tables and area for the kids to eat and have cake. After your reserved time, you will be asked to move to the regular seating area where you and your guests can sit and enjoy our facility as long as you prefer. Click here to send free custom Evite invitations. Please call us at 844-355-7752 if you need any help reserve your party online. Deposit Policy: $100 is required to make a reservation. This deposit is not refundable if the party is cancelled less than 30 days before event day. However, if the party is cancelled more than 30 days before the event date, the deposit will be refunded.